A compact refrigerator is the ideal solution for smaller living quarters, wet bars, cottages, and student dormitories. They're perfect for keeping your favourite foods and drinks cool and refreshing. This magnificent appliance by Danby can serve up 1.6 cu. 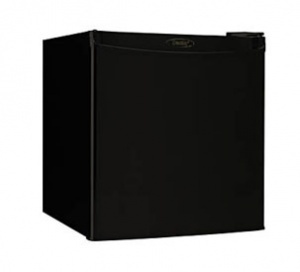 ft. (45 L) of cooling area and also boasts a full-width freezer compartment for ice cubes. It features a built-in CanStor beverage dispenser and has plenty of room for two-litre bottles. The sleek unit comes with a valuable Energy-Star rating which will help keep your power bills to a minimum. It provides a chic integrated door handle as well as an easy-to-use semi-automatic defrosting system. The sophisticated mechanical thermostat is designed for accuracy and the attractive appearance allows it to easily fit in with any type of decor. This reliable fridge offers a 12-month warranty on parts and labour with convenient carry-in service as well.